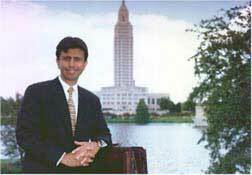 His desi credentials notwithstanding, Bobby Jindal does not get my vote. Bobby Jindal is running for governor of Louisiana. If you are desi and haven’t heard this yet, then you’ve been either out of the country or too preoccupied with your life to care. I’m inclined toward the latter, but with G.W. Bush in the White House and with this constant state of fear produced by his administration, we must get involved. One of the expectations from our community is that if “one of our own” runs for office, we must support that person, regardless of their politics. I reject this line of thought. Ethnicity is important to all of us, but it does not determine our politics. I like Bobby Jindal, but I don’t support him for governor. On the morning of September 30, 1993, a terrible earthquake (magnitude 6.3) struck the Latur and Osmanabad districts of Maharashtra. The government later told us that close to 8,000 people had died and that over 30,000 homes had been destroyed. The scale of the earthquake was very significant. A few hours after the earthquake had struck, I received a phone call from a student at Brown University, Pooja Sarin. Several months before the call, Pooja and Raj Dave of the South Asian Students Association (SASA) from Brown had contacted me. Since I worked in Providence at Direct Action for Rights and Equality (DARE) on a campaign to remove tobacco advertisements from the areas of the working class as well as to challenge police brutality, these students had expressed an interest in being involved. I remember when a group of them led by Pooja Sarin and Raj Dave came to my office at DARE to ask how the SASA could get involved in the struggles for social justice being fought by our polycultural community (made up of Black folk from the U.S. South, from the Dominican Republic, Hmong hrefugees and poor Whites). They brought a fiery sense of the injustice in the world to my office located in one of the more battered parts of the city of Providence, but one that housed the most resilient and hopeful population to which I have been introduced in the United States. Now Pooja wanted to do something, anything, to help those who had survived the earthquake and whose lives needed to be rebuilt. In the typically organized fashion of college students, the SASA gathered for a daily fund-drive in the Brown post office and collected money, as well as held a fund-raiser dinner one evening not long after the earthquake. The money was sent to a relief agency in India and it turns out that some homes had been built for their effort. When I remember these Brown students, I think of them as the Latur generation: they had already held numerous political workshops on campus, many of them had been involved in the effort to make Brown more democratic (to allow community people to use the library, for instance, and to ensure that it admit people independent of their means to pay). When they hosted the 8th Annual SASA Conference in March 1996 they made sure to include political discussions that are often not heard at the mainly social, partying SASA. I remember many of these students with joy. Even as I don’t remember Bobby Jindal, I feel that he belongs to this Latur Generation. He was a smart aleck, who when once asked by his elementary school teacher, “Why is it that all Indians are so smart and well-behaved,” answered, “It was the food.” Jindal left Brown for Oxford, then went on to help rescue the Louisiana Department of Health and Hospitals, work as executive director of the National Bipartisan Commission the Future of Medicare (also known as the Breaux-Thomas Commission) to try and help save the health care program for the 40 million elderly and disabled, run the University of Louisiana system as its youngest president, and finally, to serve in the George W. Bush administration as health policy advisor in the Department of Health and Human Services. This is an extraordinary resume for someone who is only 32. His commitment to public service certainly puts him in Brown’s Latur Generation. Why is this smart, energetic, well-intentioned and generous young man a foot soldier in the Bush crusade? Why would he join-up with a political movement that is generally committed to the very wealthy, that has a disregard for ethnic minorities, and that has put forward laws against immigrants that stifle the life-blood of our communities? What has brought Bobby Jindal to the Grand Old Party, the GOP, the Republicans? My disregard for his candidacy is not over his own personal integrity, his talents or his accomplishments. I am dismayed by his political loyalties. The GOP, unlike the Democratic Party, is a genuine political organization. It has a closely controlled group of operatives, a very disciplined cadre of Congressional representatives who actually follow the Whip in the House, and it tends to be very focused and regimented in its message. There is no wavering from the message, and as the right wing of the GOP is now in dominance, that message is decidedly right wing and hardly mainstream. Jindal opposes the right of a woman to have control over her body. The test for this control is generally fought on the battlefield of abortion, but the real issue at stake is not abortion itself, but who gets to tell a woman what she can and cannot do with her body. “I am pro-life,” Jindal points out, but because there are 15,000 abortions in the state of Louisiana (a pro-life state), he proposes to regulate abortion. He considers the medical professionals that offer a woman the right to choose, “an abortion industry” and hopes to use “informed consent” and other such laws to ensure that pressure is put on women to accede to others for decisions about their persons. Jindal hinders modern scientific research. While modern science breaks many barriers, one of the most astounding areas for research has been in biology. The use of genes has provided a vast sum of knowledge and, for lesser or worse, we have learnt all kinds of things from it. “Our society must do all that we can to help alleviate human suffering,” Jindal says, “and that certainly includes more scientific research.” On this point, Jindal calls for a ban on human cloning. Under the term “human cloning,” however, the administration includes stem cell research, whose benefits include organ regeneration (according to Dr. Mick Bhatia director of stem cell research at London’s Robarts Research Institute), brain therapy (according to Professor Svitlana Garbuzova-Davis of the University of South Florida’s Center for Excellence for Aging and Brain Repair), reversal of paralysis (according to Professor Douglas Kerr of the Johns Hopkins School of Medicine). To take a doctrinaire position on stem cells (“human cloning”) is to miss out on very important areas of medicine, including in the field of gene therapy. Jindal threatens the secular American state. Along with his GOP counterparts, Jindal has pledged to promote “faith-based” initiatives in human services that the government provides. This is contrary to the wonderfully secular Constitution whose dispensation allows many of us of different faiths space to live freely in the United States. There are many who have taken Jindal to task for his own conversion to Christianity. I do not join with them. Jindal has the right to make any decision about his spiritual faith that his conscience allows. Indeed, I celebrate when a human being is able to find an ideology that gives him or her some comfort in this cruel world. However, the GOP is currently in the mood to foster its evangelical fervor on the rest of us. The mainstream (68% of those surveyed by the Pew Research Center for the People and the Press) opposed the President’s Faith-based initiative for its erosion of the secular principles of the state. Reverend C. Weldon Gaddy, a Baptist head of the Interfaith Alliance, told the media on January 30, 2001, “This whole thing is a religious-liberty nightmare. You can’t have federal funds supporting sectarian proselytizing.” Reverend Jesse Jackson told the AME Church on February 4, 2001, “I’m all for faith-based programs, after-school programs, senior citizen programs, transportation ministries. But I fear federally funded, faith-based initiatives. Don’t let them get into your books, because they are wolves in sheep’s clothing. Money is seductive; the church needs money, but it needs independence even more!” For more on the right-wing evangelical agenda of the GOP and the Bush administration, I recommend as a primer Michael Lind’s Made in Texas. George W. Bush and the Southern Takeover of American Politics, Basic Books, 2002. Jindal supports an armed society. If you’ve seen Michael Moore’s Bowling for Columbine, you’ll know that a society with guns is one that has a terminal illness. The epidemic of gun violence in our society calls for some drastic solution. How can a man who champions medicine and well being not see that guns are an enemy to public health? Because of the ease with which children can get handguns, the Centers for Disease Control reports that the rate of death among kids under 15 is almost 12 times higher in the United States than in other industrialized countries. These kids are more than 16 times more likely to be murdered with a gun, 11 times more likely to commit suicide with a gun, and 9 times more likely to die from a firearm accident than the combined rate of death for children in 25 other advanced industrialized states. In 1992, children died from handguns in the following numbers: Australia (13), Great Britain (33), Sweden (36), Japan (60), Switzerland (97), Canada (128) and the United States (13,200). These are just a handful of issues with which many of us radically depart from Jindal. And yet we are told, we must support him because he is desi… Hum Tum Ek Kamare Mein Bundh Ho. Nimi McConigley, a Wyoming state representative, is a founding patron of the Asian-American Republican Club, and had this to say of her long tenure in the GOP, “Twenty years ago, I was proud to become an American because I believed in the values and principles on which this nation was founded. The Republican Party offers the hope to make America the nation that so many of us from other countries saw as the land of freedom, opportunity and hope.” Keep in mind that this comment was made in 1995, while the Gingrich House tried its best to squelch all opportunity for immigrants and as it pushed the Clinton administration to pass the draconian 1996 immigration act. McConigley’s most egregious position was her support for English-Only, cold comfort for most of us immigrants: even if we speak English (with an accent), we benefit from the liberal climate created toward all immigrants by such policies as bilingual education. The English-Only movement was a thinly veiled attack on all immigrants. She also displayed impatience toward the poor, “people who use lack of money as an excuse for their inability to get the job done.” When McConigley said that her hero is Gandhi, one could only wonder what the great man would have thought about her heartlessness to those who are less fortunate? Fortunately she lost the election. The compulsion to support someone because of ethnicity is false. No one assumes that an ethnic community shares a singular politics. The reason there is this compulsion is because we are a small community in the United States: only 2 million out of 300 million (just more than half a percent). There is a belief any modern society that political office is a mark of social acceptance: if a desi gets elected to high office this means that the “native” population has finally seen desis as those who belong. I sympathize with this feeling, but it is not one that I subscribe to. To believe that we must support any desi is to lock ourselves in a small room, making us suffocate from the claustrophobia of ethnicity. Blood or ethnicity does not automatically make for good politics. Just because Jindal is a desi does not mean he earns our support. We have to read his positions, see what he plans to do on the issues that are meaningful to us, and then take a political not a sentimental position on his candidacy. Without such scrupulousness, we’ll end up promoting candidates that operate against the general tenor of the desi community. From the mid-1960s till recently, the Democratic Party has been the party of choice for desis who could vote. Nevertheless, as Mira Kamdar of the World Policy Institute points out in the recent issue of The Subcontinental (“A Move to the Right? The Shifting Sands of South Asian American Politics,” www.sub continental.org), well off, professional desis seem to be gravitating toward the GOP. But the move is gradual. The most affluent Indian Americans who live in Silicon Valley donate vast sums of money to Democratic candidates: Jessie Singh of BJS electronics, for instance, was a major donor to Mike Honda’s successful run for Congress in 2000. Among the 25 desi candidates who ran for public office in 2000, most of the credible candidates came from the Democratic Party: these included Kumar Barve (Maryland House of Delegates), Satveer Chaudhary (Minnesota State Senate), Swati Dandekar (Iowa State Assembly). Others who held a Democratic ticket and made a strong showing include Ayesha Nariman, Vij Pawar, Stuart John, G. Nanjundappa and Shawn Aranha (Rahul Mahajan ran on the Green ticket for Governor of Texas). Bobby Jindal seems to be a decent man. Whatever his personal achievements, he is going to conform to the discipline of the GOP and he is going to be used as a false symbol of the GOP’s “inclusiveness.” Let us not promote someone who stands with those who want to make mayhem in our world, just because they share an ethnicity with us. That is the crudest, most vulgar form of politics.